2012 – NEW HORIZONS is a photographic investigation project by Dutch artist Bruno van den Elshout (1979, The Hague, NL). Between 1 January 2012 and 1 January 2013, the project captures 366 x 24 hourly portraits of the North Sea horizon from the rooftop of the NH Atlantic Hotel in The Hague. 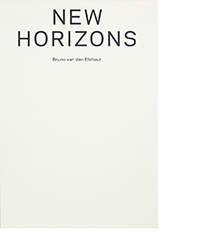 This small publication celebrates the first physical exhibition of art works from 2012 – NEW HORIZONS at Broft/vanderHorst Galleries in The Hague (NL). It contains all horizons taken on the 5th of May 2012. This book also serves as a prelude to a final publication.